Guides the environmental, economic and social development, redevelopment and conservation of the community. Responds to contemporary development trends. Recognizes diverse development patterns, building types, and density. Three-tier review process for new development, redevelopment, and special districts to accommodate different size projects and varying development patterns in the city. Design guidelines for compatible development in context with historic and older neighborhoods. No downtown parking requirements to reduce surface parking areas. Density bonus for mixed-use and higher density housing developments. Go to the Bookmarks feature to find a specific Chapter or type a word in the find dialog box to search the entire document. The UDC is approximately 4.5 MB and may take awhile to open depending on your connection speed. This user guide is not intended to cover every aspect of City development regulations, and should not be considered the final or definitive authority on any of the matters it addresses. It is only a general guide. Contact the Planning Services Department for assistance and additional information pertinent to your project or property. 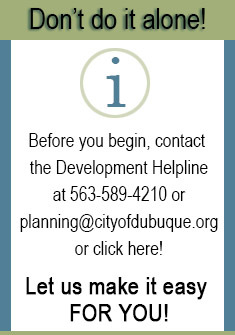 For official regulations adopted by the Dubuque City Council, please refer to the City Code at http://www.sterlingcodifiers.com/codebook/index.php?book_id=803.